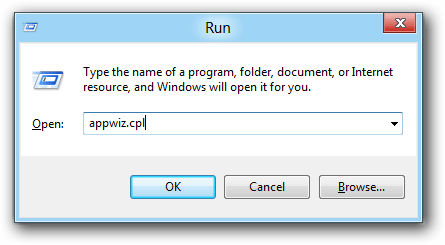 “Can’t start the Windows Phone Emulator. 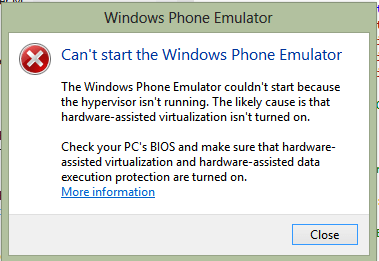 The Windows Phone Emulator couldn’t start because the hypervisor isn’t running. The likely cause is that hardware-assisted virtualization isn’t turned on. There can be many reasons why the emulator won’t start, if the following solution does not work try take a look at the links in the bottom of this post. 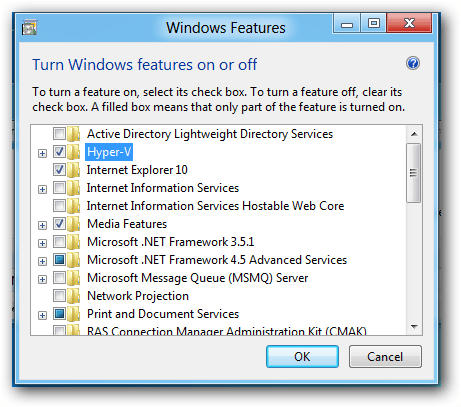 Select “Hyper-V” and press Ok. Let it install and restart Windows. After the restart start up your Windows Phone 8 Project again in Visual Studio and it should now start the emulator without errors.